Now you can use their products and pray without having to take your make-up off. Halal meat for Muslims has been readily available in the UK for years, but now a business woman has gone a step further by launching a range of halal make-up. The cosmetics - which includes everything from lipstick to eyeliner and blusher - are made in strict accordance with Islamic law, using plant extracts and minerals instead of alcohol and animal products. Samina Akhter says she set up Samina Pure Make-up because she felt uneasy praying while wearing non-halal make-up. ‘I don’t feel comfortable praying with make-up on not knowing what was in there. ‘When I researched what was in make-up I found there was a lot of animal products included. ‘I was shocked to find that some products contained alcohol and even pig placenta. ‘Many Muslim women like me have been frustrated by wanting to look good and follow their faith. Beauty Confidential: Should you put sunscreen over foundation? Samina, who runs the business from her home in Birmingham, started importing the make-up from Australia six months ago. She now has more than 500 customers as well as interest from America and Indonesia. The cosmetics are shipped in from Australia and certified by the independent Halal Certification Authority Australia. Prices range from lipsticks for £8 to full make-up packs for £65. 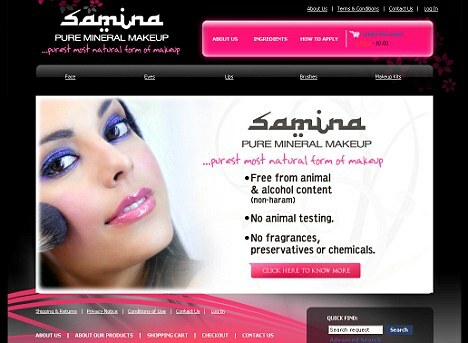 Samina Pure Make-up is the first company in the UK to sell halal certified make-up. Halal means anything which is lawful in Islamic law and prohibits the consumption of pork, blood and alcohol. Products which do not conform are known as ‘haram’. Samina said: ‘I’m not saying “Such and such product is haram and we are halal - you have to use us”. But some Muslim leaders have expressed concern that the word ‘halal’ is being used as a marketing gimmick. Sheikh Haitham Al-Haddad, a leading Imam in the UK, said: ‘Sometimes people misuse or abuse this word and put halal on any product. ‘I’ve seen the word halal stamped on fish and this is ridiculous. ‘If the product contains dead flesh or meat, any pig or haram [forbidden] animals like dogs, or any alcohol, then generally it is impermissible. ‘If the product contains a very small amount of animal or alcohol, then some scholars say it is permissible.